Our DeLaval VMS exclusive, hydraulic powered robotic arm provides extended reliability and reduces service requirements when compared to pneumatic systems. DeLaval VMS hydraulic arm is fast, quiet, robust and gentle. Its repetitive procedures are consistent too, just as the cows like it. The arm is made of reinforced stainless steel to withstand the harsh environment. It handles teat preparation before milking (including optional pre-spray), attaches the teat cups, re-attaches if needed, aligns the milk tube and sprays the teats after milking. The high performance teat visualisation system has an optical camera coupled with dual lasers to help ensure fast and accurate teat localisation for quicker and more dependable attachment rates. DeLaval VMS truly sees the teats. Modelled on a human arm’s flexible movement range, this multi-purpose arm easily accommodates high, wide or low udder irregularities and teats with an inclination of up to 45°. You can milk even more cows by taking advantage of the various attachment strategies. This flexibility benefits you by allowing more cows to be compatible with DeLaval VMS. Reducing expenses related to involuntary culling contributes to a more profitable dairy operation. The teat preparation process is recognized as one of DeLaval VMS´ most attractive features. Each teat is individually cleaned with warm water and air, then stimulated, pre-milked and dried before milking. Only a few seconds are needed for optimum teat sanitation which results in high milk quality and better milking capacity. The teat preparation cup has its own separate line so no dirty pre-milk ever makes contact with the main milk line. Several features are fully automated to save you time and keep the system running around the clock in the most hygienic condition. It starts with the integrated splashguard automatically backing-up behind the animal to divert manure and urine away from the stall and milking area. Programmable automatic floor cleaning allows your cows to stand on a clean surface at all times. All the cups are rinsed inside and out between each cow. The cups then face down so they can drain and stay free of debris that could otherwise fall inside. DeLaval VMS almost instantly detects any fall-offs and initiates retraction then rinsing of the teat cup before re-attaching it. There is even automatic teat disinfection after milking, with the possibility to select various operational modes. The extreme duty stall provides perfect harmony between design and engineering. The robot arm, gates and robot frame are electro polished to give the station its unique, award-winning look and allow for easy cleaning. The rest of the station is made of either brushed or painted stainless steel. We minimize the use of plastics to maximize the value of your investment over time. The station has an open design, offering you easy access to the cow and the option to attach manually. The stall has a stainless steel built-in floor and is bigger than previous versions to accommodate the growing size of cows. For your cow’s safety and comfort, there is no bulky equipment under the cow during milking and she rests on a slip-resistant rubber mat. Every quarter milks out differently. DeLaval VMS is equipped with one milk meter for each quarter to record time, yield, flow, conductivity and blood. The system’s management software gives you access to the status of each cow, to help you make the right decision at the right time. Cows are individuals and DeLaval VMS treats them as such, without compromise. 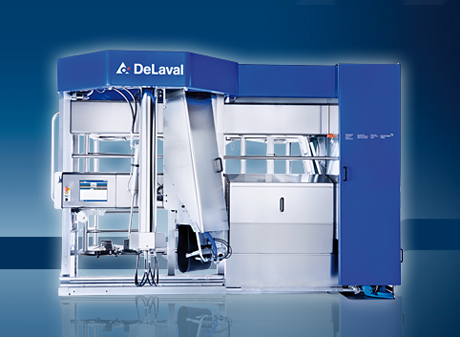 From the oil-free air compressor to the special teat cleaning cup and food grade stainless steel milk transfer lines – milk quality is prioritised in the DeLaval VMS. Four optical, quarter milk meters monitor deviations and abnormalities in flow rates, yields, conductivity and blood levels. Abnormal milk can be automatically diverted away from the main tank, while the management software records all the data and events to facilitate your management decisions. The optional DeLaval online cell counter OCC is exclusively available for DeLaval VMS. Now you can get an accurate somatic cell count measurement for every cow at every milking and enjoy a wealth of information in real time. Software support is available for DeLaval OCC including connection to DeLaval VMS cow monitoring with reports and SCC graphs. Work smarter not harder. DeLaval VMS is designed to make your life and work easier. A touch-screen interface at the ergonomically designed milking station provides you with fast and intuitive control of the entire system. To easily train a new cow, the station can be switched to manual mode so you can comfortably and securely attach her by hand. There is no need to manually program the teat coordinates when you start a cow. With the Auto-Teach feature, the cow’s teat position is automatically identified and milking can proceed immediately to save you time. DeLaval VMS management software is a powerful assistant that helps you make the best decisions at the right times. This fully integrated software gives you control over your cows, milking, cooling, feeding systems and so much more. The Cow Monitoring tool is your main control panel. It easily and quickly identifies cows needing your attention based on deviations in milking interval, conductivity, blood and milk yield. The software can also help you manage cow traffic in the most efficient way. Save even more time with the automatic adjustment of milking permissions based on time, expected yield, lactation number and DIM. The system’s software can transform your laptop computer or PDA into a wireless remote for even more control and independence. You can also access the DeLaval VMS system from any computer located in your house, office or anywhere you find most convenient. We call that peace of mind.